Since my little angel doesn't drink from a bottle, we have started giving her water in a cup, and she absolutely loves it! "Oh Mom....I just love smiling for the camer..."
"Oo, oo....I want to chew on that camera....oo, oo...I almost got it!" Linnea's first time in the shopping cart, and Daddy let her try on hats...she doesn't look like she is enjoying it, does she? And this is Nora...she is the daughter of one of the gals I meet with every other Wednesday. Do they look the same age (besides the hair)? Nora is 3 months older!!! I know...she is petite!! And this is Jocelyne, she is two weeks younger than Linnea. She is Linnea's Sunday night band buddy, as her daddy plays in the band. Her new favorite sleeping pose. She sleeps on her side and tilts her head upwards...poor thing, it looks SO uncomfortable, but she seems to enjoy it. When I went in to get her up this morning, she was sleeping on her stomach for the first time!! It was the most precious thing! And this is Daddy once again making Linnea the happiest girl in the world! Apparently a mocha frappachino isn't such a good idea at 6:30 at night......but it gives me a good excuse to be able to write. Now, what shall I choose to write about? How about a message by John Piper I just recently listened to. The last half of his message hit me hard, convicted me, made me so thankful, and was an ever needed reminder of God's truths.....my Dad recommended it after losing my rings, and I am very grateful (Thanks Dad!)! He addresses the sin of impatience, which he describes to be "murmuring against providence when we are forced to walk the path of obedience in an unplanned place at an unplanned pace." So basically, impatience is when I am not pleased when my expectations are not met. I have been struggling with having my expectations thrown out the window time after time after time lately, and have been growing impatient with myself and my daily circumstances. I am slowly but surely realizing that expecations only lead to discontent, because we NEVER know what God is going to bring our way. God uses whatever means to conform us to the image of Christ, and half the time (if not more), it isn't what we expect! So much of what Piper says and the the examples he uses have really been a great reminder of Truth and an eye-opener of God's grace toward me.....not to mention it convicted me and kicked me in the pants! Let's start with Joseph. The one in the Bible....the Old Testament Joseph. Now HE is something to write about! Talk about a man who's expectations were shattered to pieces, time after time after time. He has this dream of becoming great, and yet His brothers throw him into a pit to die... he probably was so thrilled that they changed their mind and helped him out....only to sell him as a slave. He gets assigned to Potipher in Egypt, and becomes quite respected, only to be thrown in prison for pursuing purity. He works his way up in prison, and is able to interpret the dreams of a men who could be his "ticket" out the there, only to be forgotten for years. How about a 14 year old girl who was labeled a Huguenot (French Protestant) and was asked to renounce her christian faith, and for refusing to do so, she was put into a tower by the sea with many other women for 38 years. She was young, beautiful and marriagable, and yet lived in a tower for 38 years! Or how about Benjamin Warfield, a famous theologian from the old Princeton school, who's new bride was struck by lightning on their honeymoon and was paralyzed for the rest of her life. He had dreams, but God changed them.....he stayed by his wife's side for the rest of their life. Joseph endured about 13 years of shattered expectations and rejection from so many....and yet what does he say to his brothers? GOD sent Joseph! He didn't just "allow" this to happen to him...no, he GAVE Joseph those 13 years of turmoil and hardship. Did God have a purpose? Most certainly! Joseph says it himself..."God sent me before you to preserve life." God was growing Joseph into the leader HE wanted him to be. Did Joseph know that during those years....NO, but God DID. God used the sins of others for the GOOD of Joseph and the people. He had great purpose for Joseph's life. And Joseph was able to look back over those years, and thank the Lord. I look at someone like Joseph, and I say "Thank you Father for being SO gracious to me at this time in my life....for using MUCH smaller trials to chisel away at my sin." My daily expectations aren't shattered quite like Joseph's were, but none the less, they are often broken. I would expect after losing my rings to be extra careful to never lose anything again, only to have lost my wallet a few weeks later. You can only imagine the thoughts running through my head...none of which were righteous. Mostly hot anger at my own stupidity and refusing to ask God for help because I was so angry at being such a fool, and in my heart I was even angry that God would let me be such a fool. Needless to say, it took two sweet girls who found my wallet (On a sidewalk...it fell off the top of my stroller when I was walking to the grocery store, and I didn't realize it) and came to my house to return it to me, to bring me to my knees to repent in dust and ashes. 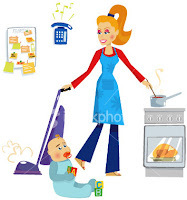 I would expect that I could get 3 simple things done in one day, like dusting, vacuuming and making dinner...things which I could have all gotten done in the matter of a few hours before I became a mother. When the day is over and the house is only half vacuumed, half dusted, and I had to ask my husband to run to the store to get me a few key ingredients I didn't realize I was missing, my expectations were once again...not met. I would expect that my daughter would nap well, since she has been going down for naps for months now. Well....you already know about those expectations. And I'm sure if you are a mother, you realize how ridiculous that expectation even is. "I'm in an unplanned place and I'm moving at an unplanned pace." I didn't see myself being here, but I am here by the providential hand of God. Oh, Lord, help me fight the sin of impatience and give me faith in future grace! I am so excited to be playing on Mommy's computer. She is such a nice Mommy! It is so nice and sunny out today. I love being outside! Mommy and me just went for a walk to Whole Foods to get me more food....mmmm, did I tell you I LOVE food!I want everyone to know that I love to eat sweet potatoes, acorn squash, cereal, and oatmeal. Oh, and I like peas as long as they are mixed with sweet potatoe. Mommy is going to have me try butternut squash, which I am sure I will like, and broccoli, which I am sure I will not like! I played with cousin Hannah on Tuesday, she got all my toys out from my basket and put them all in front of me, but when I started playing with one, she took it away. It was a fun game....she is my bestest friend. I really had fun with Uncle James, too. He entertained me! Ok, that's all. I love you all!